The project will extend tracks south from Union Station. Under the current setup, all trains must enter and exit the station from the north. Photo: Google Maps. As part of the consent calendar, the Metro Board of Directors unanimously approved Item 21, a $31-million contract for engineering work to extend regional rail tracks south from Union Station — so that trains don’t all have to enter and exit the station from the north. To prepare Los Angeles Union Station for expected growth in Amtrak and Metrolink passenger rail service, and to accommodate the future California High-Speed Rail system, the Los Angeles County Metropolitan Transportation Authority (Metro) Board of Directors awarded a contract today to HDR Engineering, Inc. for environmental work and engineering of the Southern California Regional Interconnector Project (SCRIP). SCRIP will change the configuration of some of Union Station’s “stub end” tracks to “run through” the station, allowing operational flexibility. Currently, all commuter and intercity regional rail trains enter and exit through the five track throat at the north end of Union Station. 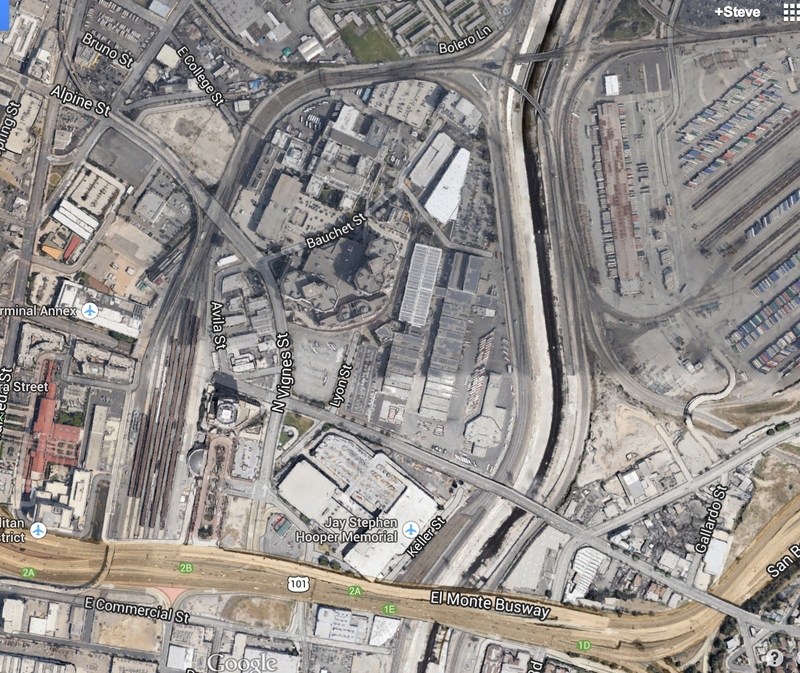 SCRIP will extend several of the tracks to exit the south end of the station, cross over the 101 freeway and join the railroad right-of-way along the west bank of the Los Angeles River. The preliminary cost estimate for the project is $350 million. The current “stub end” configuration requires an average turn-around time of 15 minutes per train, resulting in more than 40 cumulative hours of train idling at Union Station each day. SCRIP can potentially shorten dwell time for more than 50 percent of the passenger trains using the station to 2 minutes for passenger loading and unloading, thereby reducing greenhouse gas emissions of idling locomotives by an estimated 44 percent. “This project is needed for the longer term rail needs of our region,” said Metro CEO Art Leahy. “Metrolink and Amtrak operations will be growing in the coming years and SCRIP is part of a statewide integrated passenger rail system designed to meet that growth,” Leahy said. The California High Speed Rail Authority, which is a partner with Metro on the project, plans to connect high-speed train service directly to Union Station, thereby providing additional ridership for other rail providers and increasing the need for additional capacity. The preliminary schedule calls for the completion of environmental and engineering work in late 2016 with construction to be complete in late 2019. SCRIP is consistent with the long-term vision for Union Station, which is to provide regional connections to local destinations through a variety of transit modes including bus, high speed rail, regional, intercity and commuter light rail expansions. Looking forward to this project. Shorter dwell times means less diesel pollution creeping over to Olvera St and the Mozaic apartments. 🙂 For those tracks that will remain as stubs, might I request Metro look into installing some sort of setup that allows waiting trains to “plug in” and use station power instead of idling? Basically the train station equivalent of the “shoreside power” concept that they’ve been installing at cruise ports. Did the tracks ever go through? What was the configuration like during rail’s heyday? derekpowell, it was intended to have run-through tracks but budget limitations meant they were never done. This is historic and over-due. And proof the high speed rail project provides benefits beyond connecting Bay Area and L.A. (it also is partly funding construction of the regional connector). Alex Brideau III, Metrolink is a separate agency (albeit Metro is a member of the joint powers). I know a few years ago they started having trains shut down instead of idling, partly to save fuel. There were never any through tracks. The configuration was always more or less as it is now. The Gold Line was the first through track at Union Station. For the estimated cost of $350 million why wasn’t this done years ago? It looks like the pressing need is to improve the electric power capacity at Union Station so that trains can use ground power when they are idling similar to airport and cruise ship terminals. Meanwhile, can Union Station use two track throats inbound and the other two for outbound similar to runways and airstrips in order to increase capacity and decrease train idle times while we wait for the construction to complete. The track assignments through the throat are assigned based on the train origin/destinations. To/From Ventura County and Antelope Valley, the far north two tracks are used. To/From San Bernardino and Riverside (via Industry), the middle track is used. To/From Orange County, the far south two tracks are used. this has been studied before….i came to a meeting at Metro tower…. they shows illustrations of the freeway flyover….over the 5 and turn left towards the tracks and a right turn hooking up to the tracks on the L.A. river…..All done at the time when there was going to be an interruption of a contractor driving Metrolink/Amtrak trains….Did Metro forget about the proposed run through study????? are the previous studies in the basement of the Big Metro tower???? ?